How Much Does Your HOn3 C-19 Weigh? Just thought this could make a interesting topic to discuss. Needs more than me to be a discussion, though, and the subject is a little specialized. Others are invited aboard to participate in discussion and learning (if that should occur), too, because anything that turns up could work just as well in other scales and gauges in terms of getting the most out of your light steam. For data points -- this is not a survey -- we'll need some folks who want to talk about what we've done with our HOn3 Blackstone Rio Grande (and a few others) C-19 2-8-0 locos in terms of weight. I'm lazy, so will only weigh in with one of several I've owned for the time being. And it's an interesting one to begin with, the #345 in Flying Rio Grande flavor in her late years. I like the basic black. She runs great, as they all do, more or sometimes a little less (nothing in life is perfect, but Blackstone does a good job at being close). Here she is after she first arrived, next to a GE 70-tonner. As you might suspect, a bit light in the pants, but a great little loco. Her first assignment, just as with the prototype's last major assignment, was as the yard engine at Durango. I'm not sure what she weighed outta the box. She has bulked up some, I know. Maybe someone with #345 in stock form could weigh in? She has been heavier, a little, but it wasn't "helpful weight" so to speak, so we adjusted things so she soon had that old spring in her step. I'll be happy to discuss more about this rigorous "training" program, but wanted to see if others were interested in this topic before I spilled all my limited stock of knowledge, which might nonethelss be helpful along with whatever else people would like to say about the weight of their C-19. Just to note, this should include any brass C-19 owners who'd like to participate. It would be interesting to see how the two types of construction and their variations compare by weight. Soooo, how much does YOUR C-19 weigh? I have 3 of the Blackstone C-19 consols. 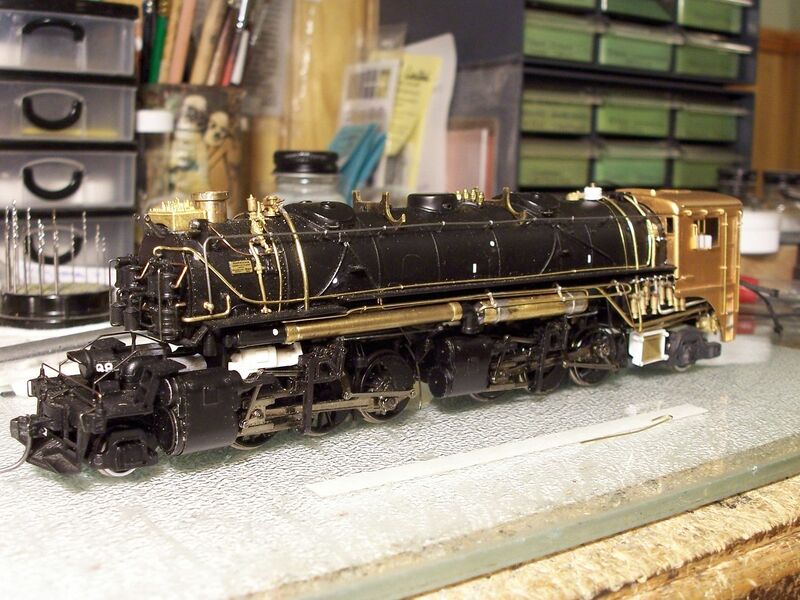 345, 343, and one undecorated that now bears my P.U.& P. #8 decaling, "Th' 8 ball", as it is known. This latter engine is my Avatar here. All three are unaltered in any way and all are within +/-2 grams of 200 grams out of box. Mike, it looks like you took on about 31 grams over stock, out of box... I did put a plastic engineer in the 8 ball...Big deal...Add a gram. The longest pulls I can imagine for these on the "PUP" are about 5 cars. I hate long trains and the mines are lucky to have 10 loaded ore cars a day to be hauled. The K-27's are left to heavy hauling 7 cars +. The C-19's are held for light hauls, caboose hops, switching and empty fetches and deliveries. There are other frieght operations, but very limited and zero scheduled true passenger operations. I am working up a two kit combine caboose that the PUP shops will crank out. On light days, the C-19's are dispatched. While I am still building and planning, (tortoise switch machines and tortoise pace on construction), what grades I might have are going to be extremely mild. So, a weighty C-19 is not needed. In my general tests of the C-19's no slipage was noted, but the story of the PUP's trackage is not fully developed, either. I do have plans to modify one of my 8, K-27's as a special MOW train engine with extended pilot and special large movable, aimable light on it for illuminating night work as daylight is reserved for trains over the single track main. Gee narrow gaugin' is fun. 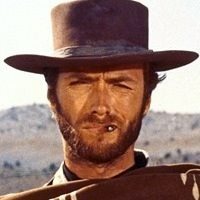 Glad I left the Big iron of my past. How many cars did the real ones pull? 16,000 lbs tractive effort is what is often cited. 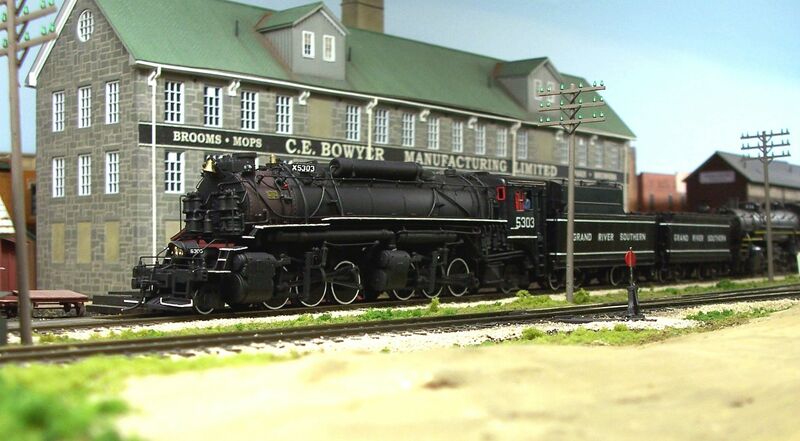 They were the "big" engines of their day in 1881, but soon surpassed. On the 3% and 4% grades that were common, it was 3 or 4 cars -- and that depended on whether they were loaded or not. The unmodded model C-19 is lucky to swing 3 up most grades, and that depends on how heavy the cars are. As we know, mass doesn't scale the same way as dimensional data does, so that's actually not bad. But it's always good to get what you can to improve operational flexibility. I have 3 of the Blackstone C-19 consols. 345, 343, and one undecorated that now bears my P.U.& P. #8 decaling, "Th' 8 ball", as it is known. This latter engine is my Avatar here. All three are unaltered in any way and all are within +/-2 grams of 200 grams out of box. Mike, it looks like you took on about 31 grams over stock, out of box... I did put a plastic engineer in the 8 ball...Big deal...Add a gram. I was hoping you'd weigh in. Thanks for the baseline numbers and confirming that whatever version you have, it's pretty close in weight to all the other stock ones. Yes, just over an oz sounds about right for what's been added. Sounds easy, but it took some imagination to figure out where and how to add the weight. I'll take some pics later to illustrate these, but I added weight to five areas of the loco. Which isn't easy to do, considering there's not a lot of open space to add weight to inside. I haven't added any inside the smokebox and IIRC there's not much room, but nooks and crannies add up, so maybe someone else has. Do you think or have any figures on any improvement in pulling power after porking your C-19 up with all that weight? It might help on grades, as you note. It was not uncommon, prior to the K-27's coming on in the first 1900 decade, to see triple heading of even short freights on the D&RGW. 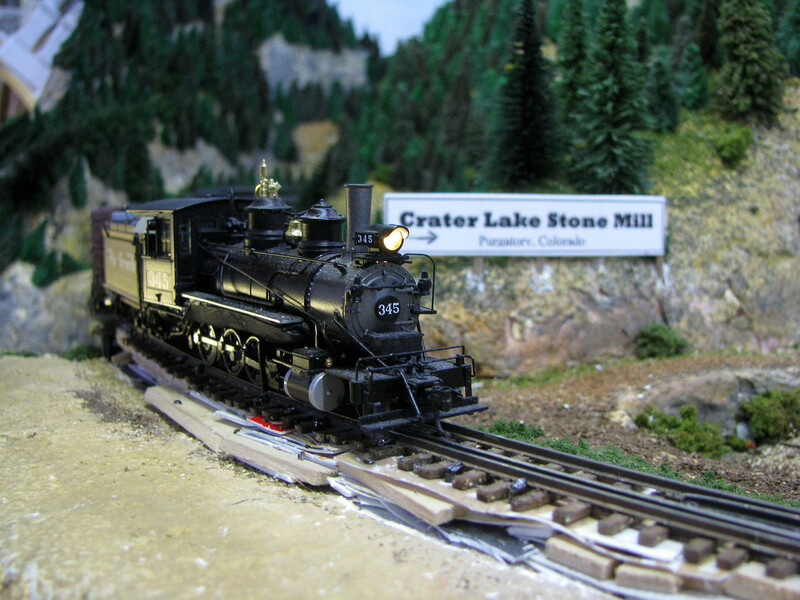 During pre-1900 snow removals, as many as 5 locos of the "T" and "C" class have been photographed pushing the rotary in this effort over Cumbres. Tales of trapped plow parties and even stuck rescue trains abound back then. Another oz on top of 7 works out to about a 14% improvement in TE. All my C-19 have a brass PSC toolbox added to the front deck. I fill the open casting (at the bottom) with tungsten putty. I stuff the stack with tungsten putty. It looks kind of smoky even without being painted flat black like I've done on several others. So what is this tungsten putty? It's a soft moldable putty made from tungsten, which is heavy. 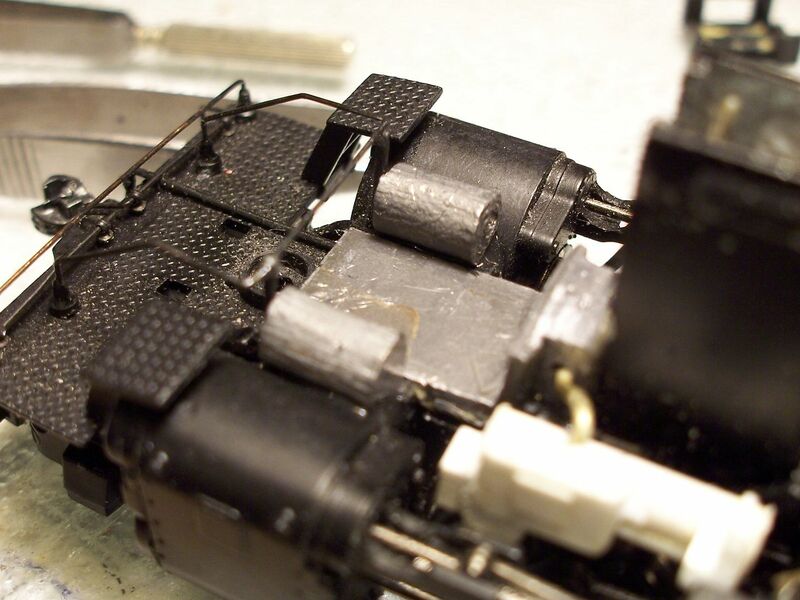 It's made for the pinewood derby crowd, but I use it a lot for where I need extra weight, at least until they release depleted uranium for civilian use. I use the Pinecar (a division of Woodland Scenics) #P3922 Tungsten Putty Weight, which is the 1 oz size. It's also available in 2 oz. There is precious little space inside to add weight. I added some to the cab by cutting up 1/4 oz lead square weights. Be careful not to add too much to the cab, as it will unbalance the loco. I ended up removing about a 1/4 ox because the front end was too light. If you look directly in the window, you can see it, but it's all but invisible in nromal viewing. There's almost a 1/2 oz of it in there. Try to pick it out in these 2 pics. On the left, I've crammed putty in on either side of the front truck's swing around the bottom of the cylinders. 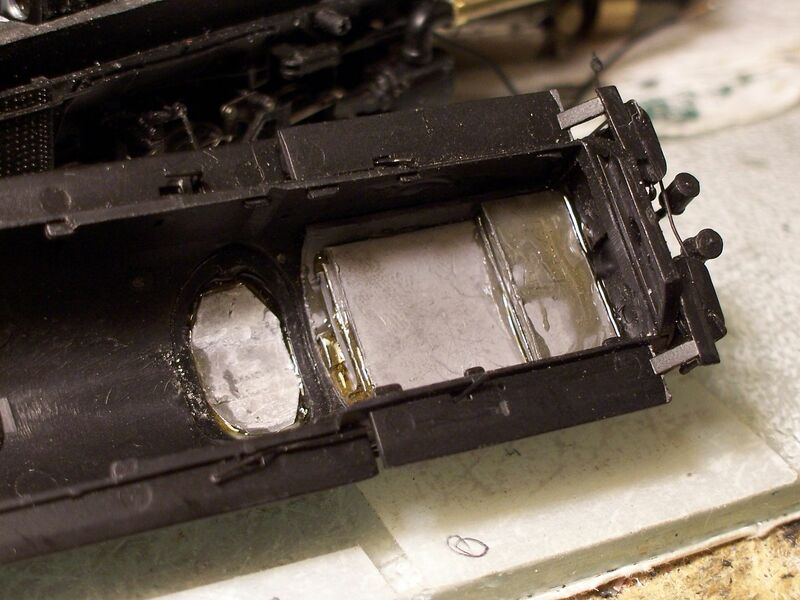 In the middle, because that's where weight is most effective, I've added almost a 1/2 oz of putty by squeezing it in under the running boards, carefully clear of the drivers, rods, etc. There are a few more places to add weight but not much space for more large amounts. Does the weight make a difference worth the ~$11 cost of the putty? It sure does. 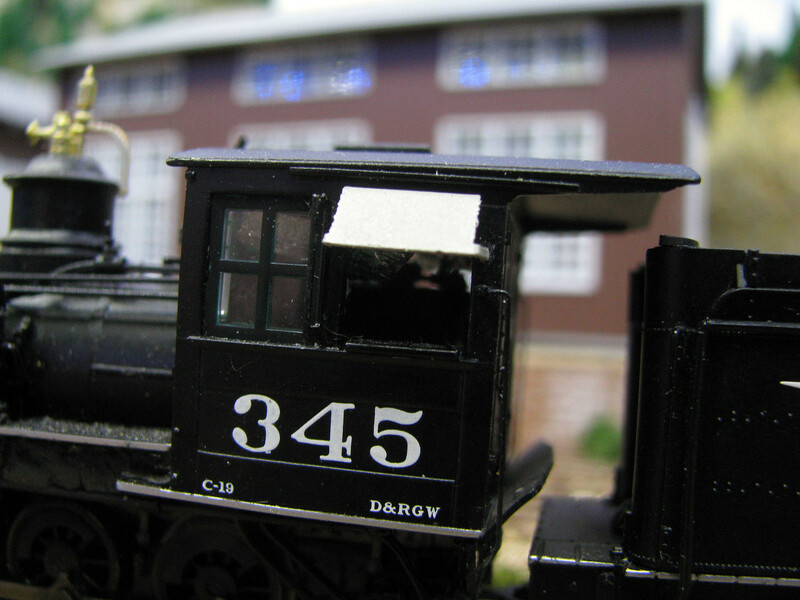 I'm reworking and modifying track around Purgatory on my Cascade Branch, which is #345's home assignment. In part, this is to facilitate getting the C-19s better track conditions so they can handle their assignment reliably. The main culprit was the stretch of track on the main leading to the bridge over gulch just past Purgatory. This is probably the most diffcult piece of track on the layout. It's a 20"curve on a 2% grade through a wye turnout. 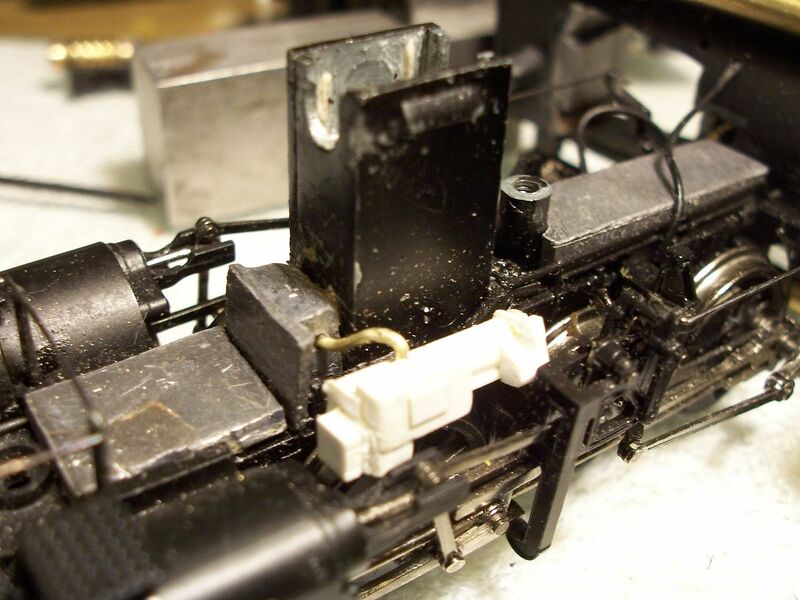 It caused headaches when the layout was first built, but got them under control. They rebonunded this fall after a particualrly wet summer. With basements, you get movement sometimes and I suspect that was the culprit, so decided it was time to get this right. Will have more later with pics , but I took 6 grams of cab weight out, replacing it with more titanium putty, mainkly under the runnung boards, then added an 7 additional grams to add even more weight. It's now at 239 grams. EDIT: For sleep-gabled clairity... ...and another important point. One interesting aspect of weighting my C-19s is the difference in performance. Although #345 weights more than my SURR #3, the #3 actually pulls better. This is not a bad thing, as #3 needs the extra mojo to handle it's 3 car passenger train that it is normally assigned to operate. Does make me wonder what the diffrerence might be, other than the fact that #345 may not have as much run time as the #3 since it was from the most recent run and #3 is first run. OK, finally getting back with some pics. I'll post a lot more about the reconstruction underway around Purgatory in my Cascade Branch thread. Here I'll just concentrate on things that apply to the C-19. The C-19 is a gutsy little loco for its size. Adding weight definitely helps its performance, but it can't conquer all. Like many 4 or more drivered, unsprung locos, the long driven wheelbase is susceptible to track irregularities. A high spot can leave adjacent drivers hanging in the air. When this happens, a bright light on the other side of the loco can show up the lack of contact if you are able to get in position to view the drivers from the side looking under the loco. How little does this lack of contact have to be? Even .010" or less of a gap can leave the drivers spinning. In the case heree, most of the track around Purgatory was laid with recycled flex track along with small sections cut and not otherwise used. 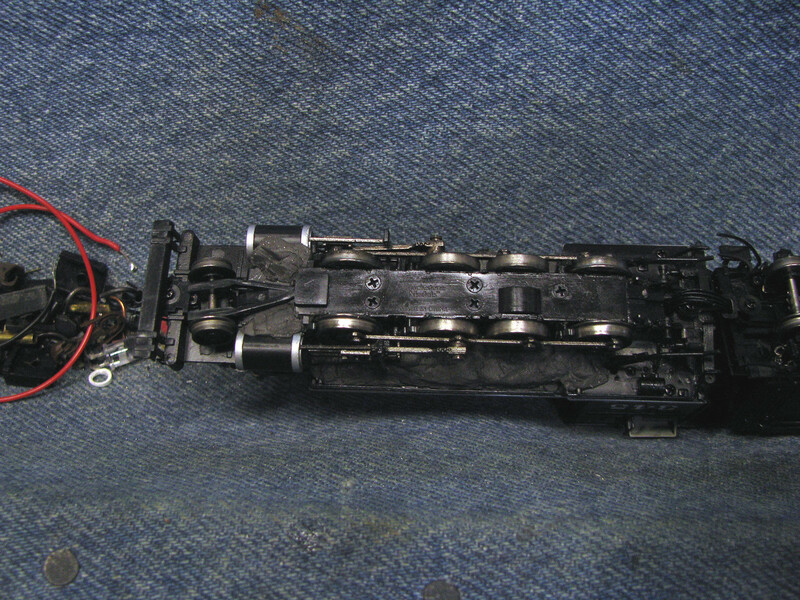 This is not a problem, except for the larger number of joints needed to connect it all, each of which is a potential source of the uneven track that can lead to lack of driver contact. 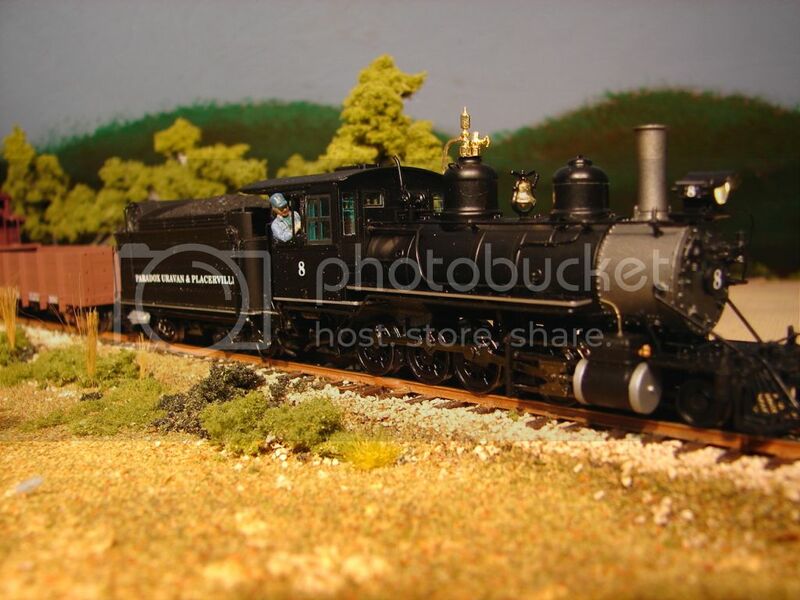 If your small steam loco stumbles on a grade, this is a likely culprit. The other big suspect in such issues is the vertical curve. Changes in grade, particularly the aburpt ones found on mountain railroads, can lead to driver spin. Both these issues are tolerable, so long as your loco is heavy enough or the grade not steep, if you "hurry" past them. In my case, things ran great before last summer's rising water table, which seems to have shifted the relationship between the walls that support the benchwork. This aggravated the factors noted above enough to produce unreliable performance. Thus my quest for more weight. Which worked -- some. But the remaining stumbles led my back to re-engineering the approach to the bridge over Lime Creek Gulch. This pic shows #345 downgrade just after leaving the bridge. The side lighting shows how the added weight below the running boards really blends in so it's unnotiecable in most cases. It does look a bit messy down below the track, but there is a method to this madness, which I do not recommend necessarily. In my case, the incremental approach -- real time engineering, so to speak -- was taken in order to resolve a complex interplay between the three curves that intesect at the wye turnout that leads to the siding, as well as each having vertical curves that also intersect here. I suppose one could draw this, but for me it was easier to build it. After the second evening, things looked like this. You'll note the turnout tacked to a piece of basswood. This minimized the elevation changes through the turnout, which parts are from a BK kit. Zero change would be ideal, but here that just wasn't quite possible. I will add some thin plastic "ties" then paint everything and it will look much better once ballast is applied. In the end, adding weight helped, but restoring track to as level as possible condition while taking care with vertical curves provides more reliable operation. Yes, that weight is loco and tender, inclusive. The Blackstone's are set-up so they are difficult to separate short of some signifiacnt challenges in getting the wiring apart and back together. 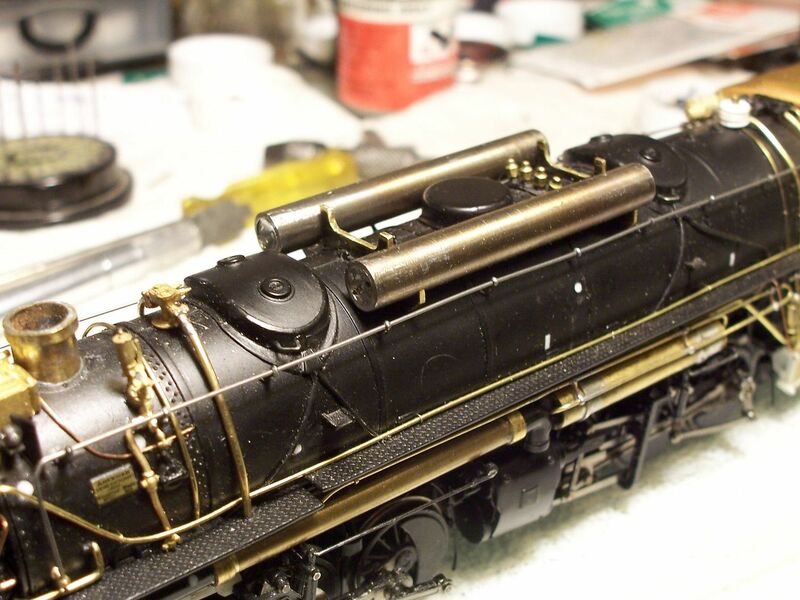 Just because it's what I've been working on, my little Gem Models brass 2-6-0 New Berlin & Winfield weighs 183 grams. In the larger direction, my Sunset C-25 weighs in at 353 grams. Is that tank on the tender's deck an air reservoir? It's difficult to tell from the photos, but I don't see any on the locomotive. If that's the case, were these particular locomotives (the real ones) always that way? While my locomotives are all standard gauge, I've added weight to all of them due to the numerous grades and curves (usually in the same locations) on my layout. 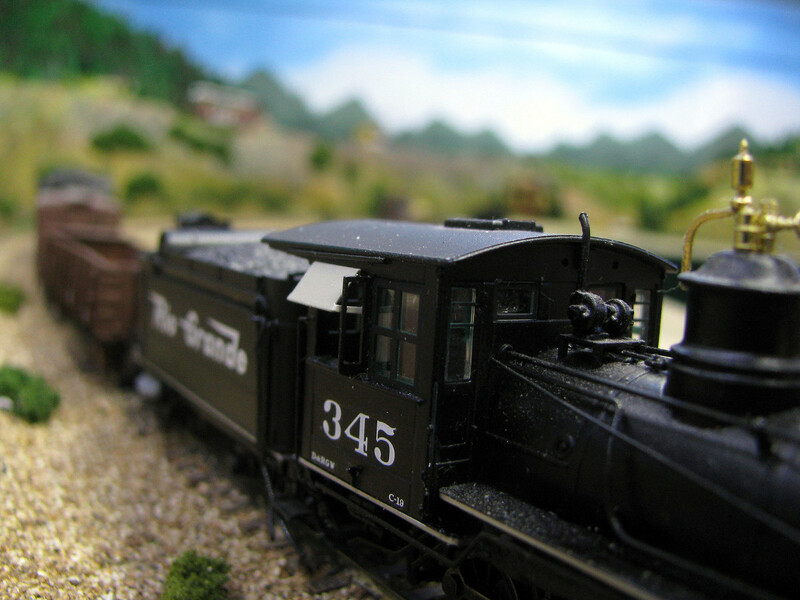 The Athearn Mikado, a very smooth-running locomotive was back-heavy, and an extremely poor puller, with a stock weight (loco only) of 12.5oz. I managed to add 4.25oz. to that, but more importantly, got the weight balanced at the mid-point of the drivers' wheelbase. Later, I was able to add more weight, while still maintaining the balance point, making it, loco only, 17.5oz. 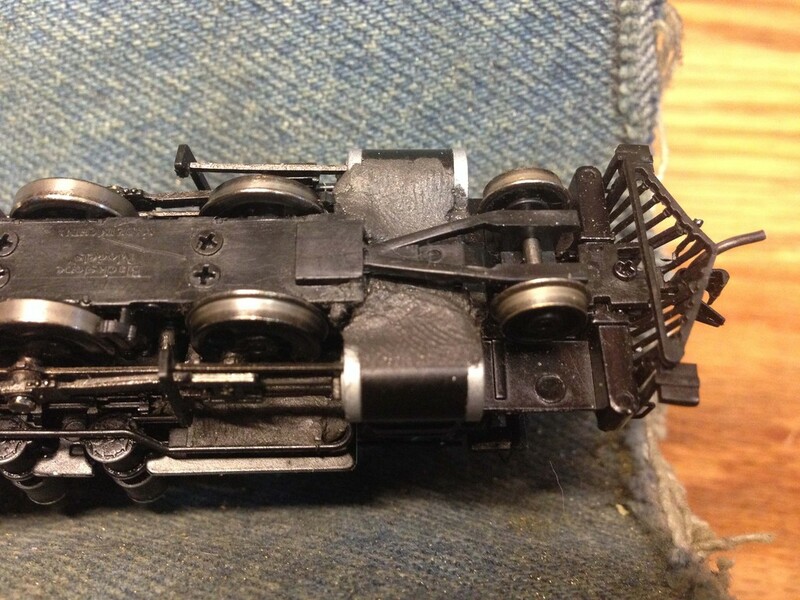 There's a how-to HERE, and while it deals only with the Athearn loco, shows some other places where weight can be added to many steamers. Yes, a good reminder to take advantage of any little spot to add weight. That's one reason I like the titanium putty, because it is so easy to do with it. I added a brass air tank on one walkway on the little Mogul I've been working on. It was cast with a large groove in the underside to save it from being too heavy I suppose. I filled it up with the heavy putty, adding around a gram in that one part alone. 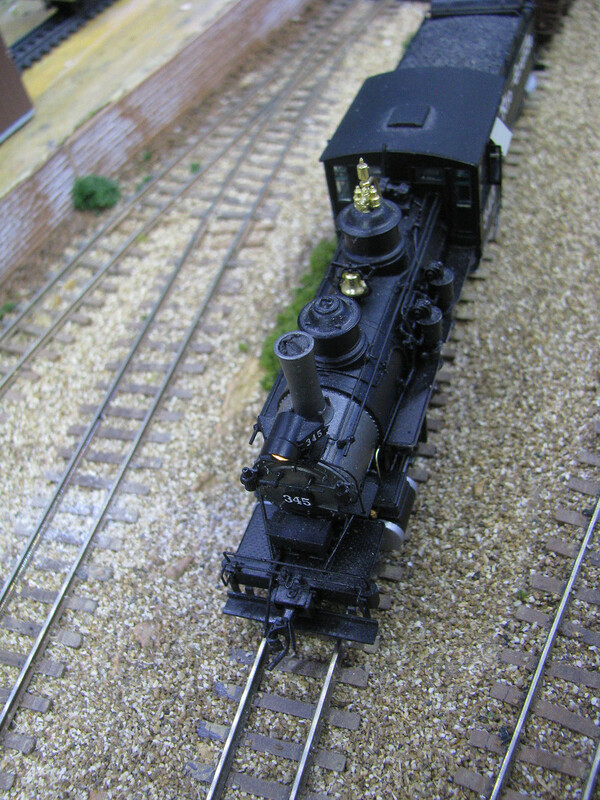 Yes, the air tank on the rear deck of the tender is a common feature of the Rio Grande's C-class locos. I suspect the ones on the Blackstone's tender are plastic. I would not add weight there, in general, because it's on tender and not the loco. My understanding is that the additional weight should go on the loco, because that's over the driving wheels. Weight on the tender is part of the towed load, which is one of the drawbacks to using steam as motive power, at least the ones with tenders as that's the first thing that needs towed aklo. 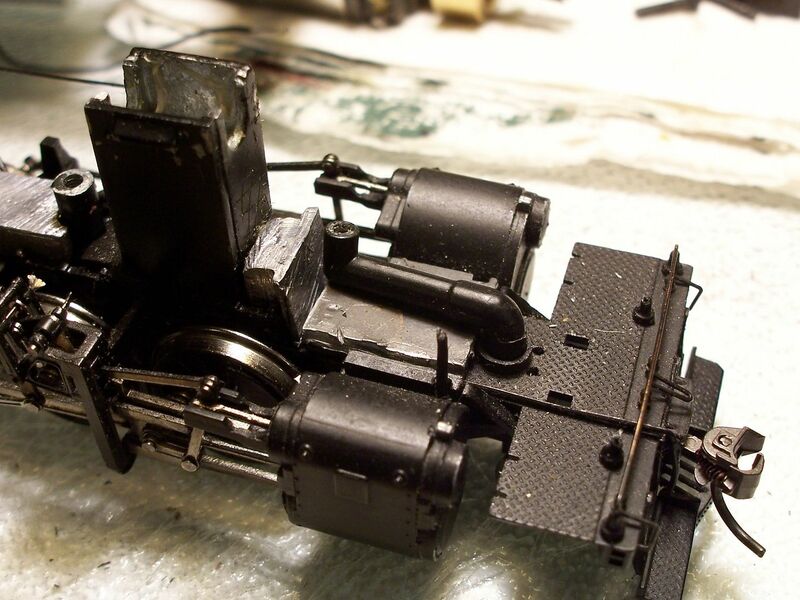 All the additional weight I've done with the C-19 models goes into the loco. Yeah, I wasn't suggesting that you put weight in the tender, but was wondering if those locos at one time had the air reservoirs on the locomotive. If so, that would allow you to modify the model, and yet still have it prototypical, at least to a specific time period. 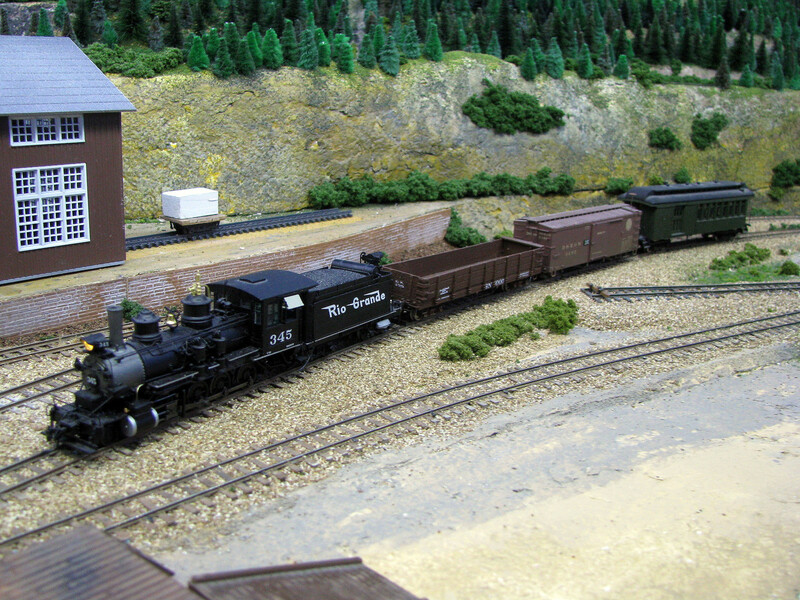 I do add weight to my tenders, along with a "live" load of coal in their bunkers. 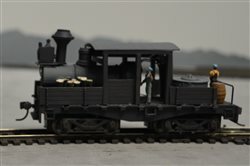 Since the locos are fairly good pullers, the extra weight in the tender ensures reliable current pick-up. Yeah, the tender needs enough weight to get good contact. I've had to do that with several bras locos, although adding wipers often does a better job of gaining conductivity than the extra weight alone will. 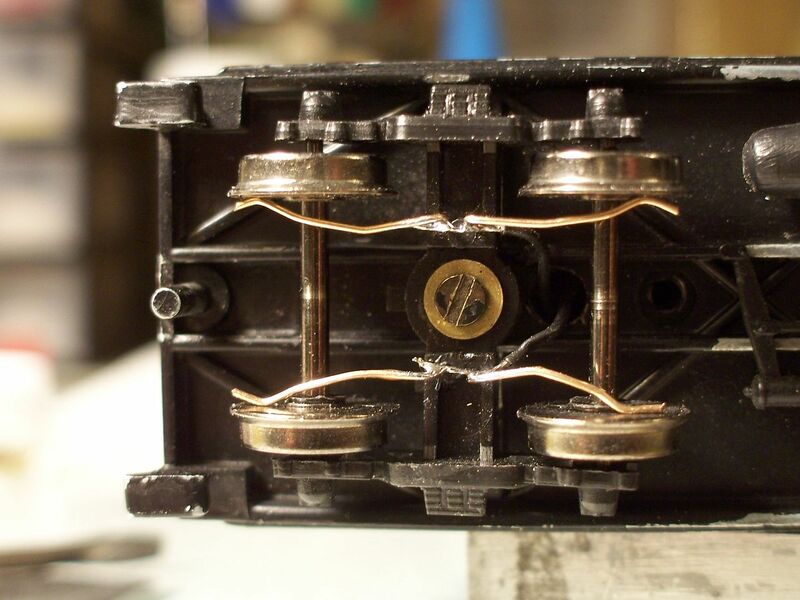 With Blackstone, the tender frame is cast metal and generally heavy enough with the decoder, speaker, etc that the factory wipers work quite well. This pic shows where I squeeze in the putty. 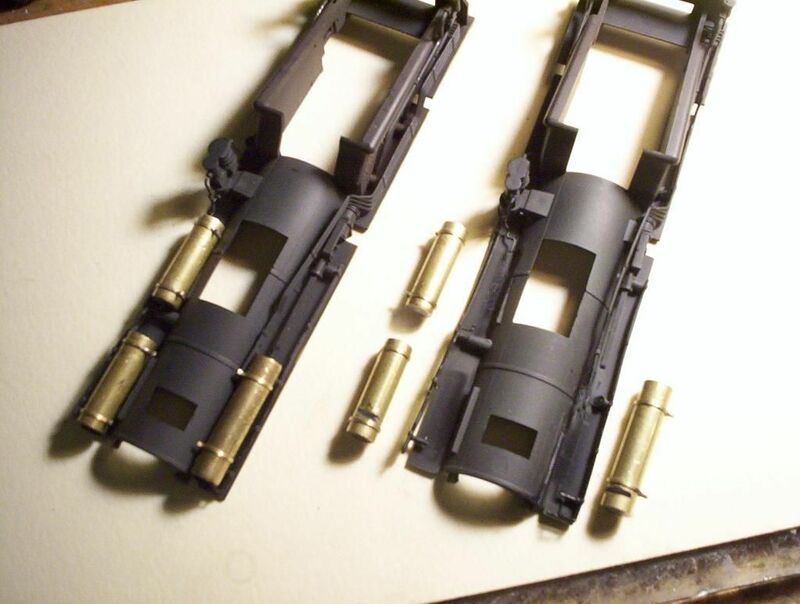 A lot will fit tucked between the lower inner cylinders. More can be stuck under running boards. In the rear, weight can be added in the cab. I was in the midst of replying to your latest post last night, but it disappeared, as did a response to another post. The putty is certainly very inobtrusive packed in behind the cylinders. Does it harden, or stay putty-like? I have 4 Blackstone C-19s... RGS 40 & 41, D&RGW 345 (late), and an unde early C-19 dressed as RGS C-16 #17. So I cheated bigtime on getting around their pulling power. I have no grades on my Rio Grande Southern First District. Yep, I get that the ruling grade was 4% over Lizard Head and Dallas Divide but this layout is my 8th, and when I look back, the layouts without grades were always the more reliable and less frustrating. I've put 7 cars and a caboose behind a C-19 with no problems. Even around my sometimes 18" radius curves they can pull what I need 'em to. I "simulate" grades by tonnage restrictions in my operating rules. A single C-19 will pull no more than 6 cars and a caboose before requiring a helper. And without actual physical grades, a C-19 can do that easily. 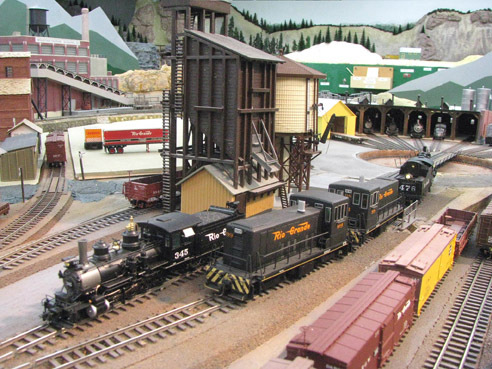 FWIW all trains on my layout stop at Lizard Head Pass for a brake check and to set retainers as it's supposed to be 4% down in either direction. Modeling the Rio Grande Southern First District circa 1938-1946 in HOn3. It tends to dry out, but very, very slowly and seems to want to remain where it is stuck. Stuff I stuck in 2013 remains adhered well. Wipers can be frustrating, but when in adjustement they really add to performance especially in the contact-challenged narrowgauges. I tend to use 0.010" Tichy phosphorbronze wire and it is easy to knock it around so I try to tuck it away as best possible. So I cheated bigtime on getting around their pulling power. I have no grades on my Rio Grande Southern First District. Have heard of doing that. Somehoe, it seems to work OK in my mind for the RGS, but just doesn't seem right for me on much of the rest of the Colorado NG. I lowered my grades from portotypical, though, as the impact on running anywhere near scale length trains would've been harsh. The layout was designed Before Blackstone, but I really like the impact the grades do have on the sounds I get from them once I have the DDE tuned right. My Key Imports C-19 #340 weighs 5oz without tender. 7.6oz with. Cheap postal scale.. may need to try that again? Sounds about right for brass. Is that tender-drive or all in the loco?